work, not the exotic and impractical methods of prolific marriage and family authors. Therapists at all levels can learn and incorporate these into their work with families. Practicing clinicians will learn what works for other therapists while graduate-level students and beginning counselors will benefit from the integration of theory and practice exemplified in the practical case examples. The rich and varied writing styles in this enjoyable volume reflect a multitude of personal therapeutic styles. You will find valuable insight and innovative treatment methods on critical family therapy topics such as eating disorders, the adolescent years, marriage counseling, stepfamilies, divorce therapy, communication difficulties, and conflicts with dual career couples. 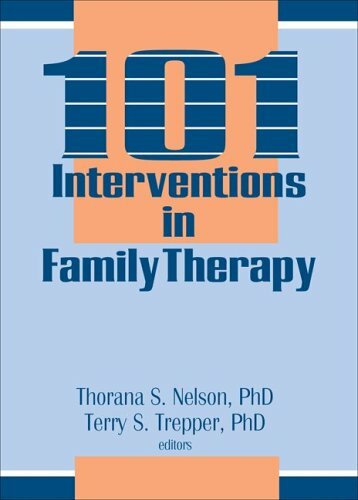 The smorgasbord of interventions found in this book include bibliotherapy, use of touch, creative use of space, ritual enactment, gift-giving, storytelling and countless other interventions, both revolutionary and commonsense, to enhance and improve your therapy with families.